Penn State scientists have developed artificial axons that could be used to replace the broken axon pathways and neurons in the brains of individuals who have suffered head trauma. Axons, which connect neurons in the brain, are important for the body’s signal transmission and communication structure. Describing their invention as new “micro-tissue engineered neural networks” (micro-TENNs), they have demonstrated that it can be used to replace broken axon pathways in the brains of rats. In a paper in Journal of Neural Engineering, senior author D. Kacy Cullen, Phd, and his team have shown that micro-TENNs were able to facilitate information across neurons and axons for all 22 days in rat brains. Micro-TENNs were also much more resilient to force than other artificial structures. More importantly, the whole process was conducted with minimal implantation, proving it to be far less invasive than other techniques. The authors were able to accomplish this by applying an ultra-thin coating of a gel commonly found in biomedical products to the micro-TENNs. This allowed for the insertion of the micro-TENNs without the use of a needle. More technically, they used molded cylinder of agarose (a sugar) that they filled with an extracellular matrix wherein axons and their connected neurons could grow in the cortex region and the thalamus. However, these are just early results, and there have been no clinical trials on humans. As a result, it will be some time before this technique can be used. Most neurodegenerative diseases affect the brain by destroying neurons and damaging axon pathways. Symptoms of most neurodegenerative diseases like Parkinson’s, Alzheimer’s, and Huntington’s disease (such as loss of motor skills, memory loss, and loss of brain function) are a result of this damage. While scientists previously held that damaged axons and neurons were irrecoverable, further research has shown this to be false. Neuroplasticity describes the phenomenon in which the brain learns to recover from previous damages. 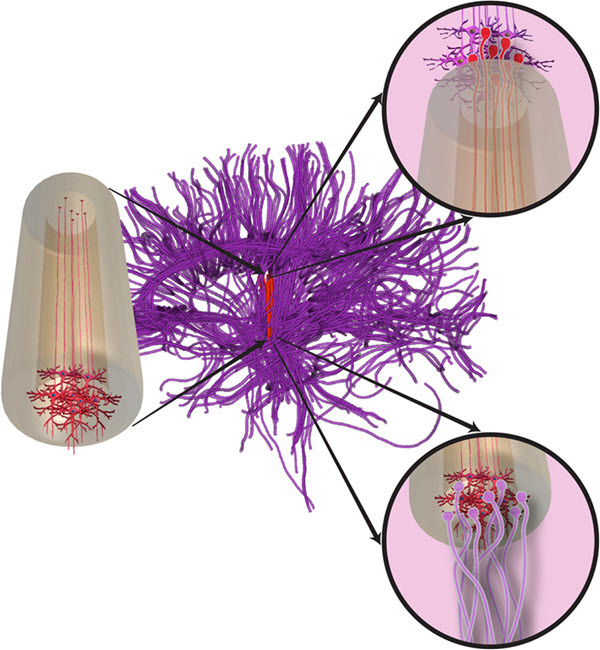 Micro-TENN takes advantage of this by providing ways of replenishing damaged and severed connections (axons). If micro-TENN is successful, it could mean that damages to the brain can be undone and that diseases like Parkinson could be halted if not mitigated. But as previously mentioned, while this research may give a glimmer of hope to those ailed with degenerative diseases, more research is necessary before they’ll be seeing this in the surgery room. In the same report, Cullen states, “Additional research is required to directly test micro-TENN neuron survival and integration for each of these insertion methods.” Still, it is a bright future.